When placed in an ordinary home oven at 275°F (130°C) for 15 minutes per ¼" (6 mm) thickness, it becomes permanently hard, and won't crack, chip, or crumble. 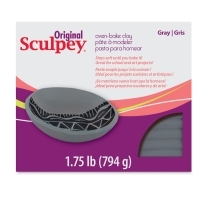 After baking, Sculpey Modeling Compound can be sanded, carved, rebaked, and painted with acrylic paint or other water-based colors. 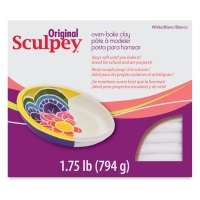 Glaze the baked surface with Sculpey Glaze. Instructions are included. Three colors are available, Gray, White and Terra Cotta. Made in the USA.